The CBC reported that 34 year old Abraham Reyes of Mississauga, Ontario has recently discovered what may very well be the world’s biggest pearl, worth $90 million (PHP4.75 billion). The Giga Pearl, which weighs 27.65 kg (60.95 lbs), was a gift to Abraham Reyes’ aunt from his grandfather who had purchased a giant clam from a local fisherman in Camiguin, more than 700km south of Manila. The giant clam was a gift from his grandfather to his aunt in 1959. Abraham Reyes calls it the Giga Pearl for its massive size. It’s bigger than the Pearl of Allah, which was also found in the Philippines, off of the Palawan Sea. That pearl was only 6.40 kgs (14.10 lbs), and worth over $400,000. The Giga Pearl is now thought to be the world’s biggest pearl, shaped life a big tooth and as big as a baby. It just so happens that Abraham Reyes grew up to be a mineral broker. Together with a buddy, he took it to the Gemological Institute of America in New York. They experts over there had never seen such a large specimen, which they approximate to be over 1,000 years old. 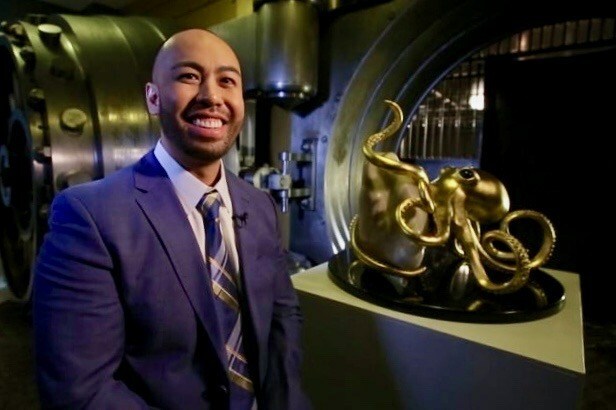 Abraham Reyes commissioned artist Bethany Krull to create a 22 carat gold octopus to hold the world’s biggest pearl. The world’s biggest pearl now sits safely in a big vault at an undisclosed location in Toronto. Abraham Reyes hasn’t decided what to do with it just yet, but he’s thinking of putting it up for display in a museum. Good job, kabayan! Enjoy the world’s biggest pearl! Maraming salamat po, Lolo at Tita!